Live dealer casino games have soared in popularity, with many players now choosing to turn to this interactive form of gaming rather than head out to play at a land based casino. If you’re a fan of playing baccarat when you indulge in a night of gambling but the RNG (random number generated) online baccarat games don’t quite cut it for you, it’s time to give live dealer baccarat a go. 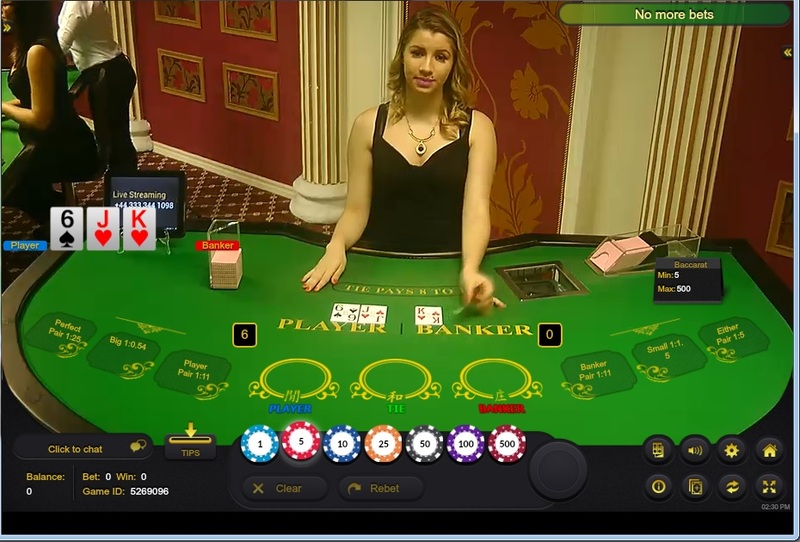 Live dealer baccarat is a game of traditional baccarat played just as it would in a land based casino, only the game is hosted by a real person from a real casino studio and then streamed to your computer using high definition video. The dealer and other players can’t see you, but you get to watch the dealer (who usually happens to be an attractive young woman) call for bets and then deal the cards so you can see the action unfold in real time. Essentially, it’s baccarat as it would be in a brick and mortar casino but rather than dress up and deal with the social formalities of playing in real life, you get to kick back at home and play this sophisticated casino game in all its glory with minimal effort on your behalf. Live dealer baccarat offers all kinds of customisable settings, including the ability to change the casino view and the quality of the video stream to suit your Internet connection. 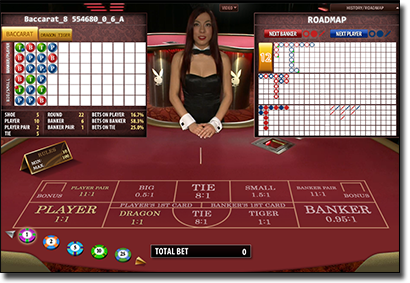 Some games even allow you to chat with the dealer and other players using a live messaging option. It’s all the ambience and excitement of playing real money baccarat from an elegant casino, but from the comfort of your own home at any hour which suits you. Live dealer baccarat games follow the same rules as traditional casino baccarat; the only difference is the game is played virtually with the click of your mouse rather than manually pushing chips across a real table. For those new to this game, the aim of baccarat is to place an accurate bet on whether the player or the banker will be dealt a hand of higher value, or whether the deal will end in a tie. Once all bets are placed, the croupier deals out a minimum of two cards to both the player and the banker, with all cards worth their face value in points other than tens and face cards which are all worth zero and Aces which are worth one point. The winning hand is the one with a value closest to a nine. If the two cards equal more than 10, the second digit makes up the value of the hand (for example, if a hand is made up of two sevens, for a total of 14, the value of the hand would be four). Some live dealer baccarat games also offer the option of placing additional side bets (like Player Pair, Banker Pair, Perfect Pairs, etc) so check the rules of the game you’ve chosen for further details regarding the side bets available to you. Which casinos offer live dealer baccarat? Guts Casino – you’ll find numerous live dealer titles from industry leader Evolution Gaming including live baccarat and live VIP baccarat. We also hope to see the new Evolution game Live Baccarat Squeeze to be added to the collection in the very near future. 1. Head to one of the casinos recommended above using our links and sign up to receive some fabulous welcome offers in the form of matched deposit bonuses and free spins. 2. Deposit some AUD to your account so you can play games for real money. 3. Head to the live dealer section and click on live dealer baccarat. 4. Once the game loads up follow the prompts to place your wager. You’ll then watch in real time as the real human croupier takes all bets and makes the play, with any winnings automatically credited to your account. Head to RoyalVegas.com, Guts.com or GDayCasino.com via our links to receive some great promo offers and enjoy the casino atmosphere of playing live dealer baccarat from the convenience of your own home.